The What: Extron is introducing a new Quantum IN SMD 100 multi-channel H.264 decoder card for the Quantum Ultra videowall processor. 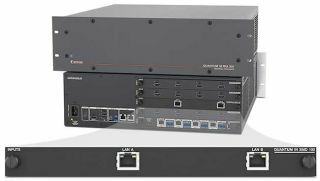 The What Else: The card decodes up to four 1080p/60, eight 1080p/30, or 16 SD resolution streams from IP cameras, Extron streaming media encoders, and other H.264 encoders. It is compatible with H.264, MPEG-2, and Motion JPEG streams at bit rates up to 40 Mbps. The IN SMD 100 features two independent network ports, allowing streams to be distributed across two different subnets, and supports push and pull streaming session management with a variety of transport protocols. It supports the video sections of ONVIF Profile S, making the IN SMD 100 compatible with a variety of streaming devices. The Bottom Line: The Quantum IN SMD 100 supports the video sections of ONVIF Profile S, making the it compatible with a variety of streaming devices.